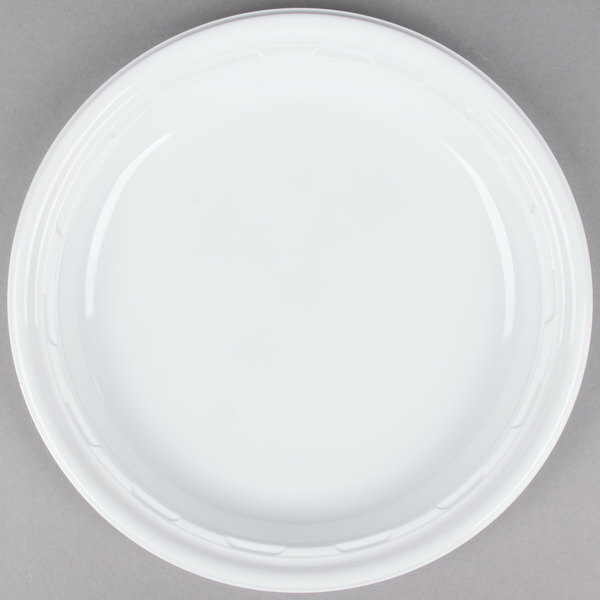 Upgrade your buffet line, catering service, or wedding venue by using this Dart 9PWF 9" white Famous Service plastic plate! 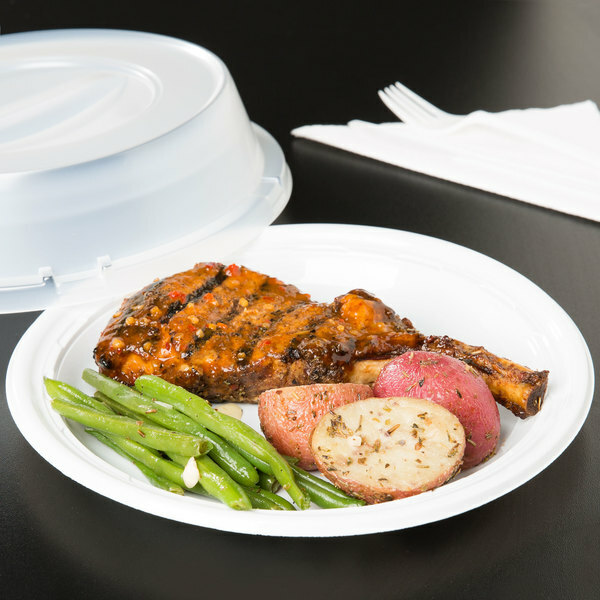 Simple, attractive, and economical, this plate provides the perfect solution for barbecues, parties, and quick-serve restaurants that need a sturdy disposable plate. It's the perfect size for side salads, hors d'oeuvres, and desserts, or you can use it to offer your guests pastries, bagels, and other simple breakfast favorites! "LOVE these plates. We had pasta (with red sauce, gasp!) at my wedding reception and not ONE of these plates dropped the ball. Super sturdy and since they were plastic, there was no soak through from the sauce. 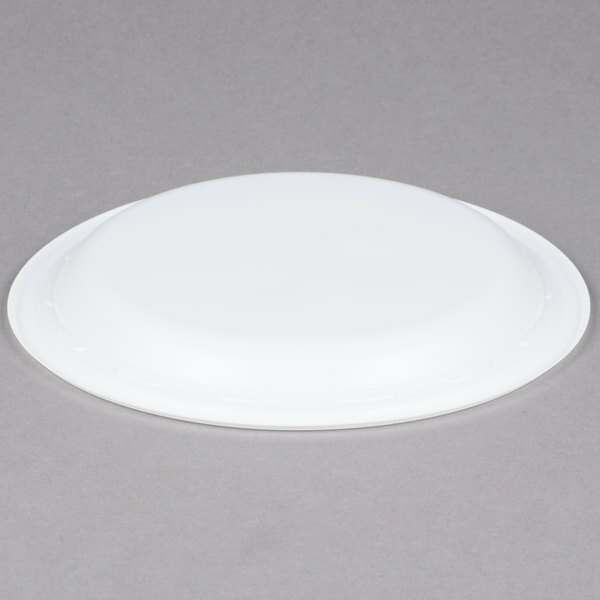 Highly recommend these plates if you need sturdy dinnerware for a party.…"
Boasting an attractive design, this plate's glossy "crystal cap" finish resembles the look of china for a sleek, elegant appeal that's perfect for a wide variety of applications. Plus, its bright white coloring helps enhance the look of your menu items by creating a bold contrast that your customers are sure to notice. 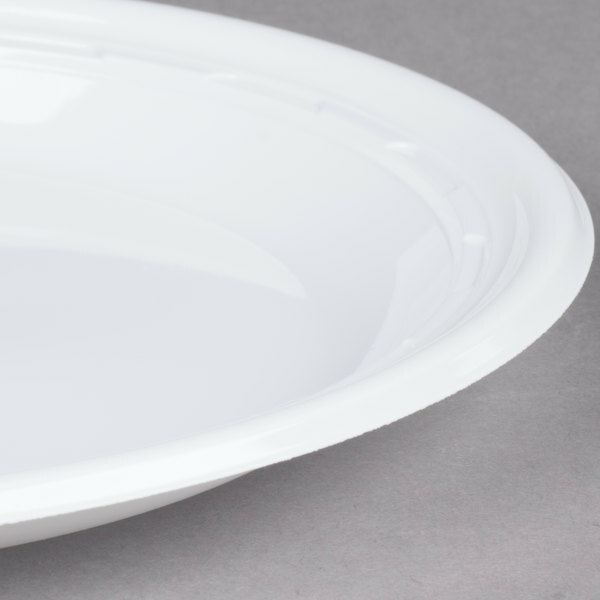 Made of high-impact polystyrene, this plate is both non-absorbent and cut-resistant, so you'll never have to worry about sauces soaking through or cutlery destroying the plate. Plus, it's excellent rigidity prevents the plate from bending under the weight of heavy foods. 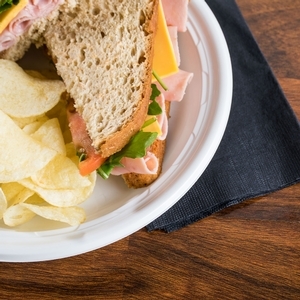 This impact plastic dinnerware nests more closely than foam options, helping you save valuable storage space, while the wide rim helps keep foods contained to the plate to limit spills. Its wide rim helps keep contents contained to minimize messes and spills. 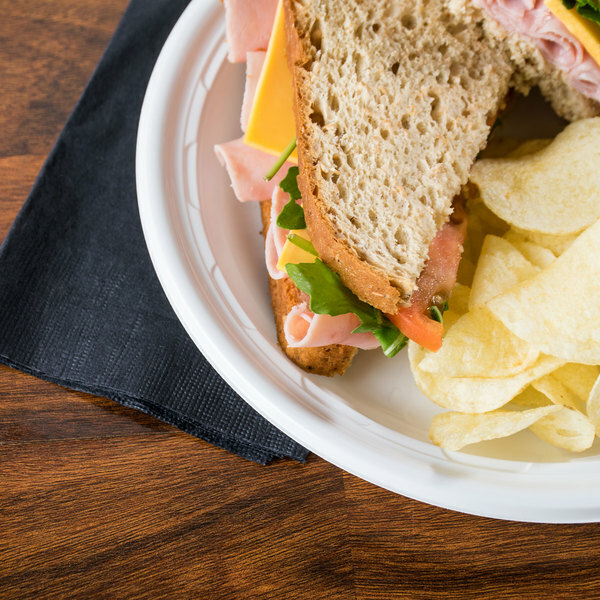 You won't have to worry about collecting and cleaning dinnerware; making cleanup a breeze! Great price, great bang for the buck. Item was as described and I will purchase again in the future. Thanks webrestaurant for providing this at a great price . 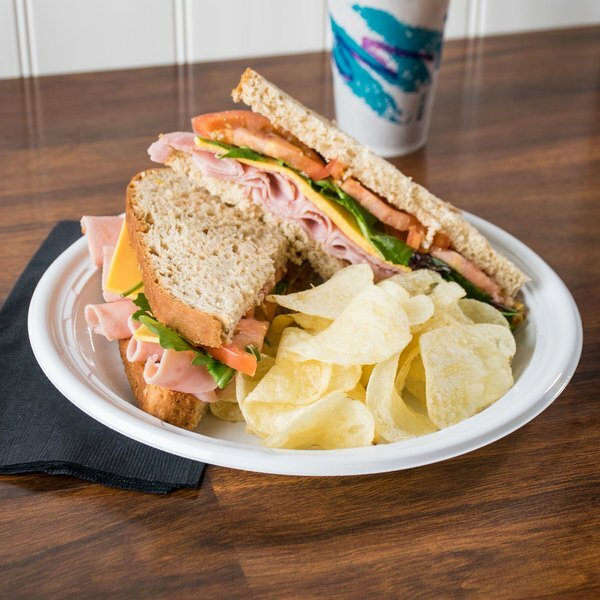 The Dart 9" plastic plate is great for serving sandwiches and salads at our luncheons. The plates are well designed and very sturdy. They plates come packaged nicely and are a great value. These are a good quality, just wish they were a bit larger and could hold heat a bit better. I would recommend them for cold products (sandwiches, etc.). I have to say these plates are actually pretty durable and they are also microwavable which I was not sure about. I only had one plate bend on me when something really heavy was on it. We bought them for our events. They are good and steady. They come packed 125 per bag in the case which is nice so you could have to worry about the unused getting dirty and don't have to take the how case with you to the event just grab what you need and go. These are nice plastic plates for everyday usage. I bought them for a rehearsal dinner. They are good quality for the price. I would purchase again. Dart Solo plastic plates are wonderful! No matter what size they are! They fit well on weddings banquets and whenever a big event comes around. OMG...these are some of the thickest plates I have ever seen at this price. The quality and quantity at this price will not be matched anywhere else. 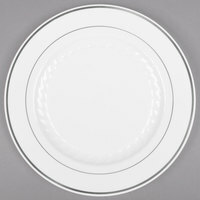 I needed an affordable, yet nice looking plate to use at a dinner party I am hosting. These fit the bill and will be perfect. They arrived within a couple days after ordering and were perfect without a crack, dent, or scratch. I would definitely recommend these place because you will not find anything better at this price. Webstaurant did it again! These 9 inch plates are a great size for portion control. You can make it look full without using too much food. It's perfect for our meals. They are sturdy and stylish. 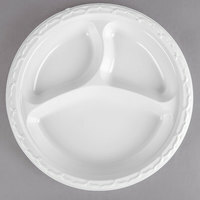 I purchased these as dinner plates for children to use at my sister's wedding reception. These plastic plates works really well. The kids cannot cut through the plates- that is a big plus. Good price for a case of 500 also. LOVE these plates. We had pasta (with red sauce, gasp!) at my wedding reception and not ONE of these plates dropped the ball. Super sturdy and since they were plastic, there was no soak through from the sauce. 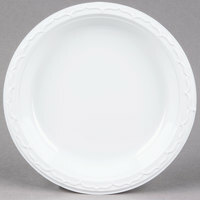 Highly recommend these plates if you need sturdy dinnerware for a party. They don't bend or break easily! This is a sturdy weight [late and won't buckle with hot foods. This the perfect size lunch/dinner plate. 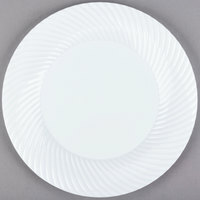 We also like to use this as a large salad plate and then use the 10" size for the dinner plate. These plates were perfect for our event. They were very sturdy and looks exactly as pictured. Perfect for heavy H'orderves. Will buy these again and again. I gave these a three star only because I thought they were going to be sturdier than they really were. The size was good, just didn't care for the flimsiness. these plates are great quility they can take a lot of use and hold it well I recomend these for everyone catering or household use you will thank yourself!! I am very happy with the quality and price of these plates. They are much better then paper or Styrofoam plates because they are grease proof and you can cut on them. They show up really well on a colored tablecloth at a sit down dinner and they are stiff enough to cut on when you have them on your lap at a picnic or BBQ. Perfect plates. They hold up under a lot of food. They look great. They are affordable. We've been using them for three year, and have not been disappointed in any way.